Goodreads must really consider adopting ratings with 0.5 increments. I would really rate this book 2.5 stars or even 3 on a good day (which after a second thought is what today seems to be, hence the change from 2 to 3 stars). It was an interesting read especially when you consider the low expectations I had when I started reading it. In atheistic circles, this book is nearly seen as a betrayal of everything good and beautiful about science and I assure you it is nothing as such, at least not how it is often described to be. I would however, really criticize Gould for not being so consistent throughout his analysis. Like for example, he seriously thinks that Thomas shouldn't have questioned about Jesus being resurrected. I mean, really? Is there a real scientist (let alone someone like Gould who is clearly passionate and caring about science) who cannot applaud Thomas for his disinterest? 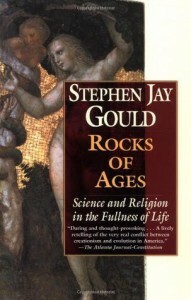 Anyway, one gets the feeling that Gould has changed his mind a little between the beginning and end of writing the book, especially when he finishes by showing his derision of those who really think the Big Bang is consistent with Genesis or the notorious Templeton foundation that year after year violates his much beloved NOMA by awarding bigger-than-the-nobel-prize sums to scientists who show that science and religion are actually two things of explaining the same thing, whatever that is supposed to mean. To come to NOMA, it is really not as bad as it is pictured to be. It is, in fact, a much more limiting factor for religion than science. Like the idea that if Science finds a fact about nature which contradicts religion, then religion must be wrong and science right. How can you disagree with such a thing? It is also an important limitation on science, which guarantees that scientific discoveries will conform more to the basic principles of science. However, there are signs of the usual cowardice when he tries to define what religion actually is. He seems (like many of those who like to be nice to religious folks) to see all religions as more or less the same phenomenon which is something I really disagree with. We really need to acknowledged that some religions are more harmful than the others. Also, he views religion as something as broad as to include the whole of morality in it. So basically when a scientist tries to talk about morality, he is actually violating NOMA which is something I am not so sure about. Anyway, much more interesting were the bits about how those opposed to religion have their own myths when it comes to the Dark Ages or Galileo and the like. The stories which are often told about the clergy believing that the earth was flat or of Galileo being more or less a martyr in the "holy" war between science and religion, are questioned and sometimes exposed to be frauds, just like many religious traditions are filled with them. So one can't help but feel the irony here, of all the places. One last idea to end my rambling with, which is about agnosticism. Agnostics really think that they are more honest intellectually and not as "fundamentalist" as atheists or religious people are, but I'm afraid their case cannot be sustained. When Gould (who is an agnostic) talks about how Darwin's idea of Evolution by Natural Selection cannot refute God's existence, I cannot avoid disagreeing with that. For one thing, God's existence (at least before the near relativism of the 20th century religions) was a response to the fascination of humans with nature (including stars, planets, fear, dreams...etc. etc. ), so when science explains it, it is really cowardly to say that it doesn't mean anything about God's existence. It makes it, at least, less likely for a God to exist and which is why I consider agnosticism a lame and not more than a politically correct idea and skeptical atheism a much more sustainable position.